Because potatoes, bread and pasta were the predominant carbs served in our home, cooking perfect rice was not high on my mother's list of things to do. She made short-grained rice and it was always slightly sticky. Even though my introduction to rice was uninspired, I have always loved rice and the kind my family enjoyed over the years was almost always the long-grain variety. As mentioned previously, I love the fragrant rices and have perfected an easy way to steam it so it turns out tender and fluffy every time (post #30). Many people steam quantities of rice in a pot or in the microwave, but there are other rice-cooking choices. Rice cookers virtually guarantee a fool-proof experience...and, for those who have no time or desire to cook, pre-cooked, packaged rice is readily available on store shelves...although, it is expensive. I would like to suggest another way to cook rice perfectly...in the oven. This method is more cost-effective if baked alongside something else...multi-use of this appliance is always great for saving energy. I also recommend this baking method if a large quantity of rice is needed; a huge panful is just as easy to bake as a smaller quantity. The wine in the recipe is optional, but it does impart a wonderful, if not gourmet flavor. Other sautéed vegetables may be added or substituted. This is a moist, fluffy and flavorful rice. Over medium heat, sauté onion, green pepper, and celery in margarine until tender. 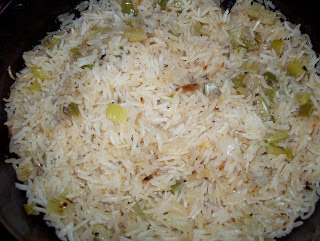 Add rice and continue to sauté mixture until rice is lightly browned. Add remaining ingredients and stir to combine. Remove from heat and pour into a greased 1.5 quart casserole. Cover and bake at 350 degrees for 35 minutes or until liquid has been absorbed and rice is tender. Serve immediately. Serves 5-6.